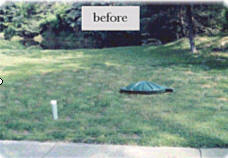 All septic systems require maintenance. To provide that maintenance requires access to the tanks. Risers are what provide that access. If you don't have risers, your yard must be dug up every time access is needed. The picture to the right shows a variety of components that might be used in your risers. Generally, you will only see the lid and a short 1" to 3" section of the riser itself. What if you don't like the looks of the risers? WARNING: Don't plant trees and bushes around the risers, because their roots will enter and clog up your tanks. 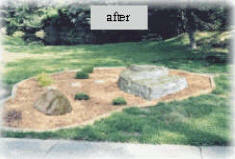 There are, however, a variety of solutions including covering them with imitation rocks. Below are before and after pictures to give you some ideas. Providing Quality Service...Guaranteed In the Greater Austin Area of Travis, Hays, Williamson, Burnet, & Bastrop Counties , Shady Hollow, Sunset Valley, Point Venture, San Marcos, Kyle, Dripping Springs, Florence, Coupland, Georgetown, Misc Locations, Bell County.